The March Newsletter is Now Online! View the March Newsletter to find out the latest news. Register now to attend, show, or volunteer. This event will benefit the Montgomery County Precinct 1 Constables. Time for some boating, crawfish, and fun! Come out to play on St. Paddy's Day! Click the image to go to the registration page. The February newsletter is now available. It can be viewed here. Visit the Board Members page to view the names of TOPPS' 2019 Officers. To e-mail a board member, simply click on the name! The date and time are set! Please register to attend the banquet which will be held on January 26, 2019 at the April Sound Country Club. We met yesterday to discuss 2019 officers and activities. Final officer vote will be at the banquet in January. Date and place of the banquet will be provided shortly. Meanwhile, enjoy some of the pictures from before and during the meeting! Submit your nominations by Friday, November 16th. You can do this by email, phone or verbally to the present officers. You can nominate a fellow member or yourself. Most positions are filled by self nominated candidates. Nominations for all 4 offices, President, Vice President, Secretary and Treasurer are being accepted in addition to any committee members or other positions that can be filled. Please join us on December 2, 2018 to discuss the plans for 2019, new officers, new members, and other important decisions. Time and place to be determined. This meeting is open to all members and non-members. Please mark your calendars and attend. 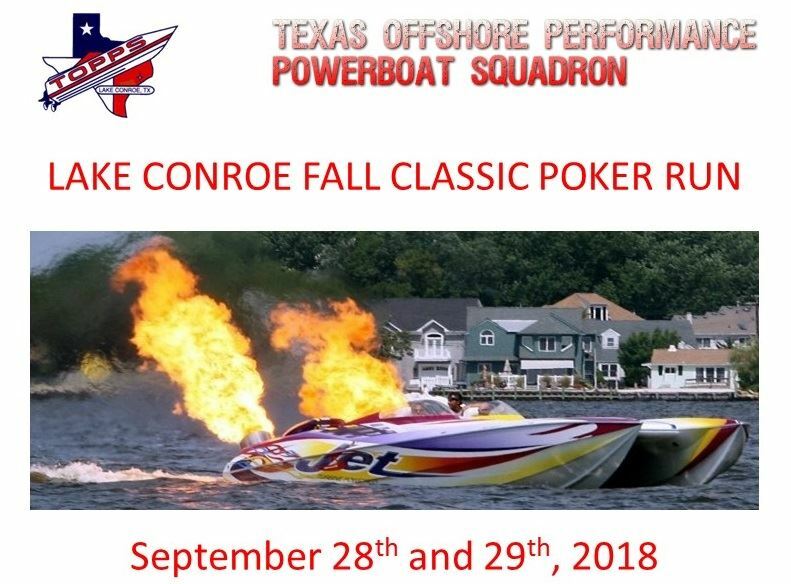 TOPPS Fall Classic Poker Run Registration Now Open! Register online for the best time on the lake! More details to follow.